I’m singin’ the praises of my latest dress! I know, it’s yet another dress. I think I’ve now made as many dresses this year as in the last two combined. Now that I’ve found a bodice I really love the fit of and can use as a block, I just can’t seem to pull myself away from making dresses. It’s seriously been the difference between me never wearing dresses in my closet and me not being able to sew dresses fast enough to wear. And I’m really pleased with how this one came together. 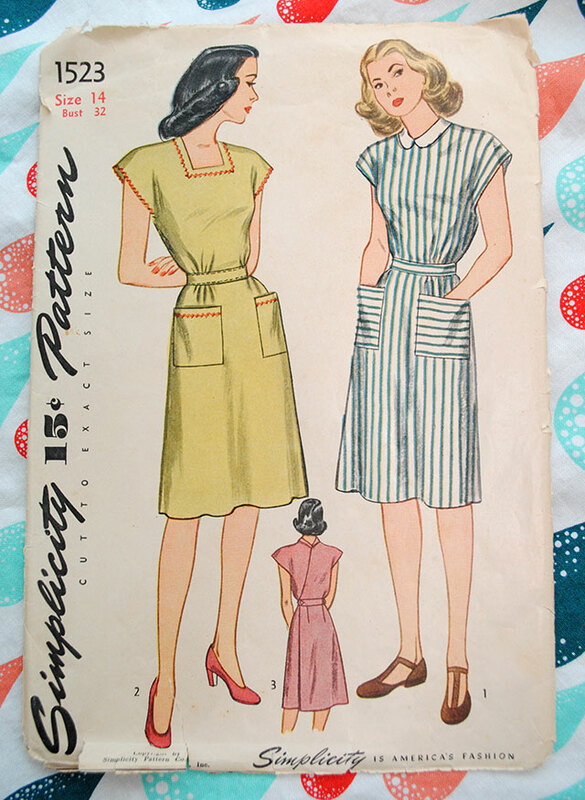 I made Simplicity 1523 from 1945, which features an inset waistband, a kimono-sleeve bodice with square neck, and a slightly gathered skirt. However, since I already had a kimono-sleeve square-neck bodice that fit me well, naturally there was no reason to try and fuss and fuss with the original bodice–I just went with the one I used for my Loteria dress. Except I lowered the bust darts again, and this time was the winner! 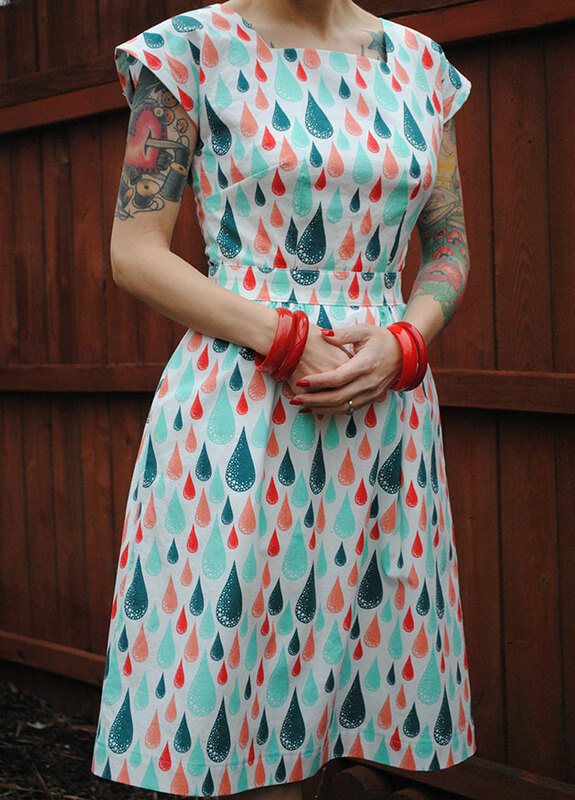 You may also have noticed the vintage pattern is a wrap dress, but I decided I just wanted a straight up normal dress. (However, I’m totally revisiting the wrap dress idea in the future, I love how it buttons at the back waist!) In doing so it meant I had to make some changes, since the back pieces were obviously shaped for the wrap over bit, so instead I just used the front piece for the back as well. I also opted to do a center back lapped zipper although I still kind of like side zippers better, I think. I keep switching between the two as my stash dictates. I took a chance just using the original waistband with my bodice without shortening it, and it worked out well. In hindsight I should probably have taken the bodice up a bit to account for the 1.5″ wide waistband, as the bodice does get baggy a tad bit when I’m moving around. Of course I didn’t decide that fast enough and I’d already started on a second version before realizing it, so whatever. Not a big deal. We’re not going to talk about matching the print along the back. Because it’s not matched… because I did it wrong, like an idiot. Pretend you didn’t know that and I just didn’t care to do it, okay? Everyone on Instagram went bananas for this fabric when I previewed it, and rightfully so! It’s a Tula Pink print from the Prince Charming collection that was out a few years ago. This fabric was probably in my stash the longest of anything, so I’m thrilled to finally sew it up! 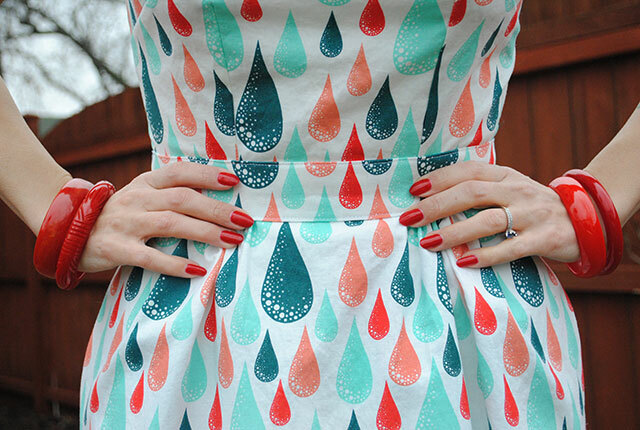 I just love the combination of coral, tomato red, aqua and dark teal with these whimsical little rain drops. Seriously, I’m still so in love with this fabric! Spiffing print…kimono sleeve bodice…there is no bad here! I give you not one BUT 2 big thumbs up…I’d even consider a third but alas I have only the average number of thumbs! What a perfectly fitted dress. And the fabric is fabulous! 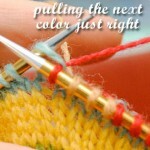 Once you find a pattern that fits you it is hard to stop, and I can see why you want to sew this over and over again. The dress came together beautifully, Tasha! I really like the waist defining element the set-in waistband brings. It’s very flattering. And, that fabric is excellent!!! Thanks Michelle! I’m really digging the waistband too. I love belts in theory but they never seem to stay put on me (even if there are carriers), so it’s kind of like the effect of a belt without the hassle! i love it! that fabric is just perfect! GURL QUIT IT. This dress is too good and you look so cute in it! You look great. 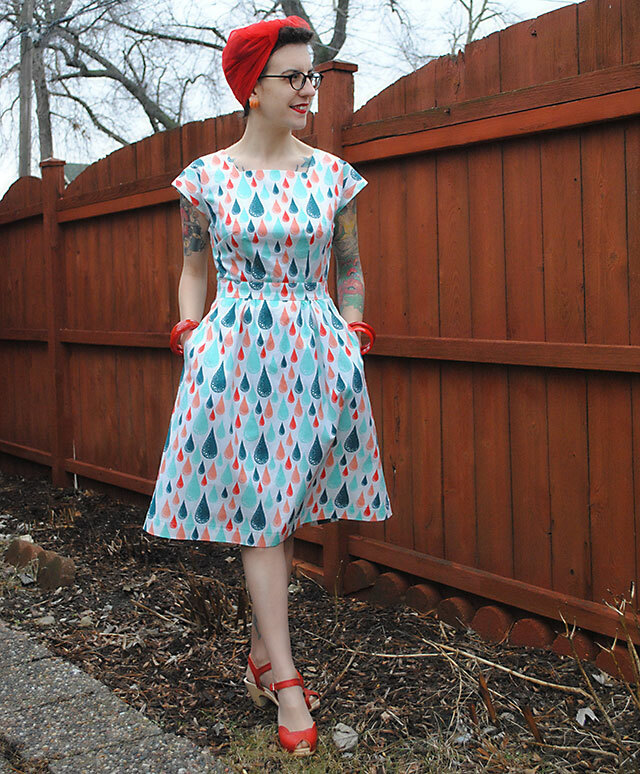 The dress is amazing I love vintage patterns but sewing skills are very much lacking. Oh my goodness, what a darling print! And this is so well-made! I am incredibly jealous of your sewing skills. I love all the red accessories you’ve paired with it, too! This dress is amazing! And wonderful! And fabulous!!! LOVE the fabric! I absolutely love this dress! Tasha, couldn’t you make a mini tutorial about how you turned the Emery bodice into a kimono sleeved bodice? I’d love to do the same! Yay, that would be awesome! Gorgeous fabric, gorgeous dress, gorgeous outfit – you look FAB! That’s all. The pattern on the fabrics so charming! I love fun prints in making clothes. I think it’s a great and flattering choice for you. And there’s nothing wrong with making a bunch of a type of garment you like. That just means more choices of something you’ll be likely to wear. 🙂 I also think it would be great with a little red bolero. Yes, absolutely! I know I’ll wear and love any dresses similar to this. I agree a red bolero would be a great topper, I’ll have to add one to my to do list! I know what you mean about the bodice that fits perfectly, I have one as well and I keep modyfying it a bit and repeating it in new dresses. Your dress made me smile. It looks lovely on you. Great shoes. Love the red bracelets, too. I made curtains for my house about three years ago in that same fabric, just a different colorway (this one: http://media-cache-ec0.pinimg.com/236x/8b/a1/4f/8ba14fd6ea7997c51e4c89e0d1721b98.jpg). I’m moving this summer, and if I don’t need the curtains for my next house, I am totally making them into a dress like yours! This is darling! I adore it! Perfect for spring! 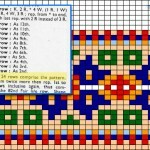 I have a pattern very similar that I made with a sombrero print. I love pretty much everything about this dress! 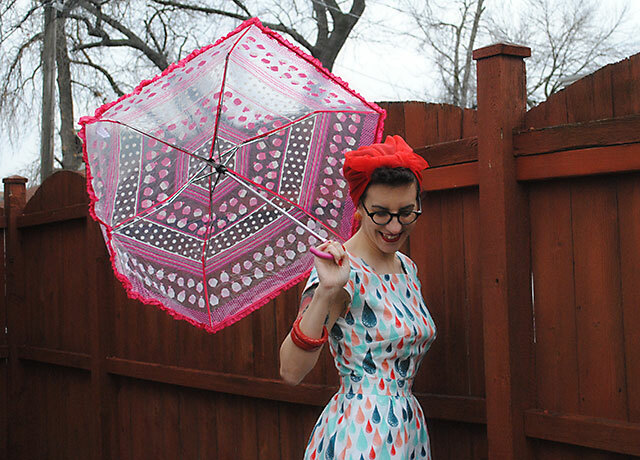 It fits you perfectly, and the pattern and colors are just wonderful! This dress is adorable! 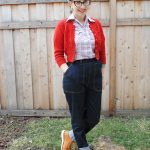 I love the style and the colors in your fabric! It looks fabulous on you! Absolutely gorgeous! You look stunning. Thanks for sharing. That dress is lovely. The little pops of red are so cheerful and your red accessories look great with it! I love your site for inspiration – thanks so much for sharing. That is fabulous!! I love everything about it. Beautiful! It looks perfect on you. I just adore those shoes also. They look so cute on your feet. Wonder how they would look on a size 9/10 foot being that they are clog style. Would you mind sharing the style name of the hasbeens? Much appreciate! Cute! You look like you should live in Seattle! Fun outfit. 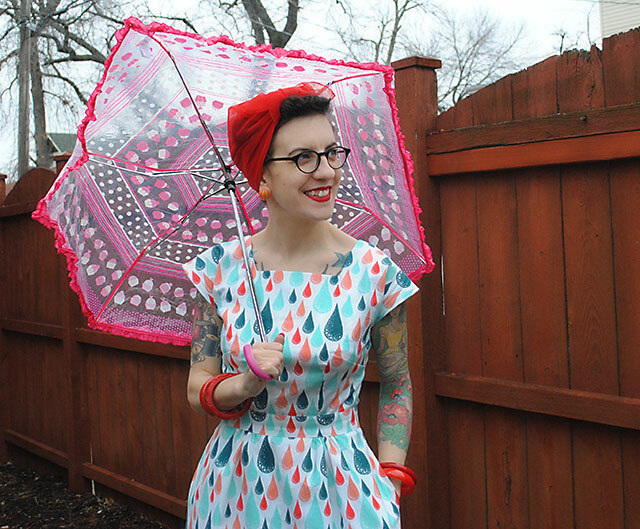 This is such a great fit on you and such a fun print, too. I am learning that get the right fit, everything else follows! I want! Looks smashing, and perfect fit! I love the print, and the shape is great on you. Stunning! Fab fabric, lovely fitting and gorgeous styling! It’s adorable! 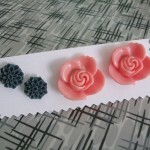 I love the colors… I need to find some fabric in the same shades to redo my kitchen blinds with. I’m fascinated by the back button wrap pattern… I’ve been wanting to make a dress with a feature like that for a while, it seems very swirl-esque. 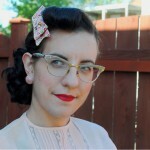 This is so cute and looks great on you! Well done!!! I happen to be wearing a dress I made from the Prince Charming line right now too! Something about these prints just scream “Spring!”. I adore your new dress, and the styling for these pictures. This dress is perfection! The cut, the print, everything. I absolutely love it! And it looks fantastic on you. I can’t blame you for wanting to make more, and more, dresses! Keep the dresses coming! I love seeing all your different versions! 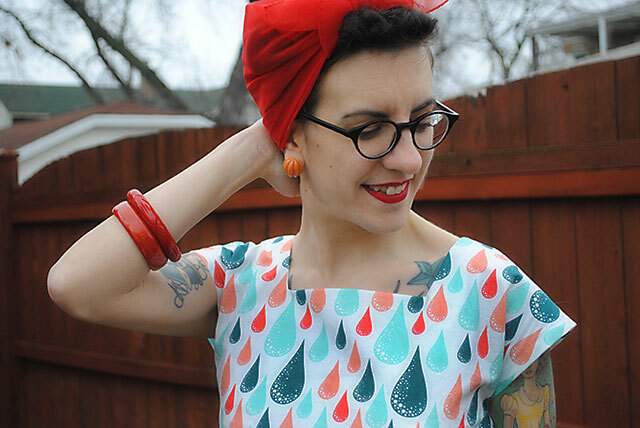 I ADORE this fabric – and the fit of the dress – so lovely! Tasha! This dress is perfect on you! I adore the colours and the shape is fabulous! Make more! More! Goodness, do I love every last splendidly fun detail of this wonderful, springtime perfect dress. It’s such a refreshing change of pace to see raindrops in hues other than (just) blue. This is one of those prints that I fell in love with when it first came out and thought to myself “I should really get some of that.” and then months went by and I forgot about it until your dress shows up and I’m like “DAMN. WHY did I not ever get any of that fabric?!?!?!”. Seriously? So. Cute. Amazing dress, it really suits you. Will be interested to see the wrap over version too. A sweet silhouette! You have a knack for choosing fabric and pattern that compliment. 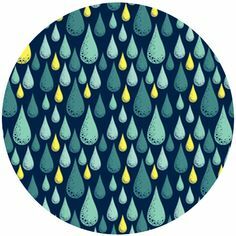 I wouldn’t know what to do with a large raindrop fabric. But you certainly did! I know I am a little late in commenting here, but I love this dress! It so amazingly perfect – the fabric is gorgeous and the fit is spot on (I need to find myself the perfect bodice block). This is a lovely dress. I particularly love the print on you. So fun and perfect for spring.